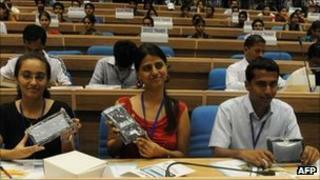 Costing a fraction of Apple's iPad, the subsidised Aakash is aimed at students. It supports web browsing and video conferencing, has a three-hour battery life and two USB ports, but questions remain over how it will perform. Officials hope the computer will give digital access to students in small towns and villages across India, which lags behind its rivals in connectivity. At the launch in the Indian capital, Delhi, Human Resource Development Minister Kapil Sibal handed out 500 Aakash (meaning sky) tablets to students who will test them. He said the government planned to buy 100,000 of the tablets. It hopes to distribute 10 million of the devices to students over the next few years. "The rich have access to the digital world, the poor and ordinary have been excluded. Aakash will end that digital divide," Mr Sibal said. The Aakash has been developed by UK-based company DataWind and Indian Institute of Technology (Rajasthan). It is due to be assembled in India, at DataWind's new production centre in the southern city of Hyderabad. "Our goal was to break the price barrier for computing and internet access," DataWind CEO Suneet Singh Tuli said. "We've created a product that will finally bring affordable computing and internet access to the masses." The company says it will also offer a commercial version of the tablet, called UbiSlate. It is expected to hit the shelves later this year, retailing for about $60. Mr Sibal says the device will enhance learning in India. Experts say it does have the potential to make a huge difference to the country's education, particularly in rural areas where schools and students do not have access to libraries and up-to-date information. But critics say it is too early to say how the Aakash will be received as most cheap tablets in the past have turned out to be painfully slow. "The thing with cheap tablets is most of them turn out to be unusable," Rajat Agrawal of technology reviewers BGR India told Reuters news agency. "They don't have a very good touch screen, and they are usually very slow." Critics also point out that an earlier cheap laptop plan by the same ministry came to nothing. In 2009, it announced plans for a laptop priced as low as $10, raising eyebrows and triggering worldwide media interest. But there was disappointment after the "Sakshat" turned out to be a prototype of a hand-held device, with an unspecified price tag, that never materialised.